Apart from financial schemes to exporters in India, Export promotion councils provide various services to encourage exporters in boosting export sales in international market. One of such services is issue of publications. Almost all of the export promotion councils and commodity boards publishes monthly magazine which provides new notifications of government pertaining to specified product. The foreign trade policies and notifications related to concerned targeted export product also is published in such magazines. The trade promotion or commodity boards also publish special circular on important policy changes and market update on related products if necessary time to time. 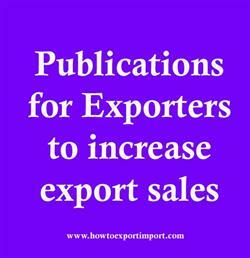 These publications to promote exports of specified product also provides valuable information regarding the fashion trend, trade statistics, market focus and other study reports to the benefit of the industry. Some of the trade promotion councils has their own well equipped library at certain locations of country. Exporters can utilize such facility especially those exporters are nearer to such location geographically. Each trade promotion council and commodity boards has their own website where in a lot of information can be collected for exporters. As a part of DIGITAL INDIA program, government supports state governments, public sector undertakings and all other government agencies to disseminate information for smooth handling of export trade. The valuable inputs are uploaded time to time through this website, so as to enable the exporters to stumble upon and update. Trade statistics to exporters are provided time to time by Export promotion councils and commodity boards. Such trade statistics are spread out to exporters either through their concerned websites, periodical publications or separately printed on specified requirements. The detailed country wise trade statistics are also provided to exporters with expert recommendations if any.